This entry was posted on May 23, 2016 by Texas Safety Supply. Prescription safety glasses is the term that is commonly known to Provide eye protection to those workplace employees needing corrective vision glasses. Before understanding the prescription safety glasses, it is important to learn about the purpose of safety glasses. Safety glasses are used by work place employees in various industries such as construction, the oil and gas field industries, manufacturing industries and even for the DIY tasks. Safety Glasses protect the eyes against accidental spillage of drops or harmful chemical vapors, dust and debris. You must have seen the construction workers, electricians, insulation mechanic and plumbers using them all the time when working on a job site. When such safety glass is provided with an additional benefit of optical correction, then they are considered prescription safety glass. Prescription Safety Glasses prevent eye injuries from occurring while providing corrective vision at the same time. Employees have to wear them instead of your normal prescription glasses during the work time because of the additional eye protection that prescription safe glasses provide. Front line workers, auditors and managers all must use corrective prescription safety glasses in hazardous environments where the potential for eye injury is present if the normally wear corrective vision glasses or contacts. Managers and supervisors must use corrective prescription safety glasses for Eye protection upon leaving an office and entering a warehouse. If you are fixing screws or even riding your two wheeler, you can still use them. Prescription safety glasses are so flexible that you can just use them anywhere against hazardous situations to prevent a loss of vision happening from an unforeseen job accident that causes injury to the eyes. 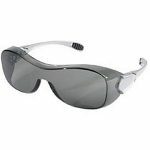 Prescription g lasses like Crews Law Safety Glasses Over Prescription Safety Glasses and Crews Law Safety Glasses Over Prescription Safety Glasses Gray Lens are available at very reasonable prices from Texas safety Supply and must be utilized to remain safe and protected as required by OSHA. These can be used over your normal prescription glasses. Additionally, you can prevent the eye injuries by remaining alert even in the most passive work time situations. Some people use them just for the strenuous tasks and tough industrial conditions. It would not be an overstatement to say that these are available at such affordable costs that you can use them daily as an alternative to normal prescription glasses. One can easily put himself on risk by choosing a wrong prescription safety glasses. You should consult your optical expert for the correct focal length of your vision and choose the most comfortable frame and fit. A safety glass that tends to drop or hang during the head movement can let you face unexpected situations during the industrial tasks. The color and coverage of the glasses is also an aspect that needs to be considered while making the purchase. In addition to owning and using the one, you have to maintain them too. The maintenance would prevent easy wear and tear issues and let you use prescription safety glasses for long periods of time. It is advised to handle prescription safely glasses with care during work hours to prevent scratches and dust build up. You can also visit the optical shop or a professional for regular cleaning of lenses and frame. Industrial owners and managers should realise the importance of eye safety gears in addition to others like gloves and respirators and provide safety glasses for all employees in their workplace. A comfortable and safe industrial worker serves the industry more efficiently than others.